Naby Camara, master musician from Guinea, West Africa, leads his group Lagni Sussu with originally composed, dynamic rhythms and songs springing from an artistic tradition over a thousand years old. Combining traditional and modern music styles, Naby Camara and Lagni Sussu bring audiences of all ages and cultures to their feet, dancing to the rippling rhythms of the balafon, the flowing notes of the kora, and strong beats of djembe and dundun drums. From the village of Kanteli in the coastal region of Guinea, West Africa, comes the virtuoso and master balafon player Naby Camara. Born into the griot tradition, Naby's musical journey took him into the griot lands of West Africa during his formative years. After studying extensively with his master Amadou Dioubate, Naby journeyed into Mali, Gambia, Senegal, Guinea-Bissau, Sierra Leone, and Cote d'Ivoire absorbing musical traditions to broaden and to diversify his musical as well as his personal knowledge. Several years later Naby returned to Guinea as an accomplished and well-traveled musician armed with a wide repertoire of griot music and incomparable experience on intricate complexities of the balafon. Naby soon evolved as one of the most versatile players in Guinea, performing with such groups as Les Merveilles de Guinee, Bala etses Baladins, Les Ballets Africains de Guinee, and Mande Yagha. 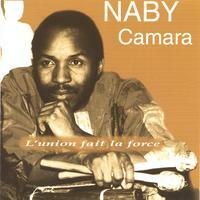 From traveling the world with Les Ballets Africains de Guineee and Fatala (which was based in Amsterdam and recorded for Peter Gabriel's Real World label) Naby gained international notoriety as a master balafon player. His innovative balafon playing shows a continuous plan the new and old, modern and traditional music. Countless collaborations with great griot musicians such as Prince Diabate and Ousmane Kouyate (an original member of Salif Keita's band), and participation in Le Bicentenaire de la Revolution in France, further demonstrate Naby's great talent as a musician. He is also the winner, with the group Takaja, of the 1995 Juno Award for Best Global Album of the Year, Canada's highest award for musical achievement. Naby currently makes his home in Seattle, Washington, USA, where he performs with his group Lagni Sussu (loosely translated as black and white people living together).